Here's a family favorite Valentines Day Game ... Be Mine Bingo! It works great for all age groups and is an easy game to bring to your classroom, Scout meeting or Sunday School Valentines Day party. Below you will find links to print our your own Valentines Be Mine Bingo game. There is a word bank with all Valentines Day related words, a list of all those words you can cut up, throw in a basket and use to call the Bingo game. Also instructions for how we played the game. We gave each participant a blank Bingo board and a copy of the "word bank" and let them fill in their own bingo board! The instructions explain it all. I would print the Bingo Boards on card stock and use conversation hearts as the markers. Horizontal or vertical lines to cover the board. For prizes, you can make Valentines Day goody bags with treats or our all time favorite prize was light up glow necklaces in pink and red. When playing with groups of children, we would let the winners pick their prize and then they could continue to play but not win another prize. We would continue to play more games until everyone won! With older kids, we would keep track of how many games they won and at the end, we would announce the BE MINE BINGO king or queen, complete with tiaras and crowns. This Valentines Day game was always a hit! Here is a new Valentine party game for adults and teens.. it is a great icebreaker and so fun! The guests are in teams and have to guess the FAMOUS Sweethearts in 3 clues or less! Clues, answers and even a tiebreaker included and it is a free printable.. while good for a Valentines day party it would work for an Oscar/Hollywood themed party or fun for an anniversary celebration for that matter any party! 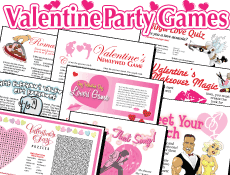 You can print this fun Valentines party game here!